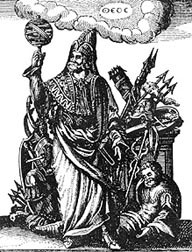 Master of all arts and sciences, perfect in all crafts, Ruler of the Three Worlds, Scribe of the Gods, and Keeper of the Books of Life, Hermes Mercurius Trismegistus-the Three Times Great, the 'First Intelligencer' was regarded by the ancient Egyptians as the embodiment of the Universal Mind. All the fundamental and basic teachings embedded in the esoteric teachings of every race may be traced back to Hermes. He was the father of Occult Wisdom, the founder of Astrology, the discoverer of Alchemy. He was an Egyptian priest, the wisest of them all, supreme as philosopher for his vast knowledge, as priest for his holiness of life and practice of the divine cults, and worthy of kingly dignity as administrator of the laws. He founded the city of Hermopolis and was the messenger of the Gods called Thoth. He authored the Hermetic Books containing 36,525 volumes which contained the entire Egyptian philosopy, 4 books on Astrology, 10 books called the Hieratic on Law, 10 books on sacred rites and observances, 2 on music; and the rest on writing, cosmography, geography, mathematics and measures, and training of priests. Six remaining books concerned medicine and the body discussing diseases, instruments, the eyes, and women.
" I am Hermes Trismegistus, One in Essence, Three in Substance. I am Hermes, the Universal Agent or Primordial Life Force, My Three Aspects are the Male, Female, and Male-Female Principles." " Know then the Greatest Secret of the Universe: As Above,So Below - As Within, So Without".
" It is true and most certain that: That which Above reflects that which is Below. Know this to understand the secret of what is infinitely large, infinitely small and in between, and the Nature, Form, Structure and Function of all things." " That which is Within reflects that which is Without, know this to understand the Secret of Creation. The inner Divine Fire of Thought creates the multiplicity of form and texture on earth. Thus, water, fire and spirit mixed by wind are contained within the substance of earth." " With utmost concentration, awareness and focus, discriminate the Spiritous Earth thus: seperate the Gross from the Subtle, first by gentle heat, then by great fire. Thus, the Subtle ascends to heaven, the Gross descends to earth, Above and Below are equalized: Within and Without are transmuted. From darkness is born the New Light and the New Energy that penetrates all substances: the Universal Solvent of Creation." " This is why I am Hermes Trismegistus: I know the Secret of the Three-In-One, thus is performed the Great Work, the mystery of the Great Akh-Nun-Ra!" Important to students and practitioners of Sacred Sound is the KYBALION which contains the tenets of hermetic philosophy known as The Seven Hermetic Principles or the Seven Laws of Hermes Mercurius Trismegistus.
" The principles of Truth are seven; he who knows these, understandingly, possesses the Magic Key before whose touch all the Doors of the Temple fly open." The great Third Principle of Vibration embodies the truth that motion is manifest in everything in the universe, that nothing is at rest, that everything moves, vibrates, and circles. Every thought, emotion or mental state has its corresponding rate and mode of vibration. And by an effort of the Will of the person, or of other persons, these mental states may be reproduced, just as a musical tone may be reproduced by causing an instrument to vibrate at a certain rate. By bringing together the First and Third Hermetic Law the ancient formula of: visualization+vibration=manifestation may be induced.